With snow in the forecast and much more cold weather ahead, it’s time to read about the season with your children and appreciate winter while it’s here. Sure it’s chilly, but that’s the fun! There are plenty of ways to play with snow and traditions you can start now so your family will look forward to this time of year. “The First Day of Winter” by Denise Fleming. What does it take to build a snow person? A song and friends! Written to the tune of “The Twelve Days of Christmas” this tale describes the ten days leading up to creating the perfect snow creature (will it be a snow man or snow woman?). Collecting trimmings such as a cap, mittens, and pockets builds the anticipation. Fleming illustrates her books with handmade paper images that are warm and colorful and uses playful words combinations. 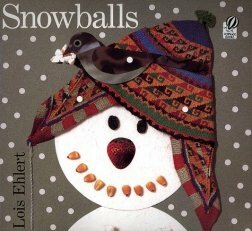 “Snowballs” by Lois Ehlert. Each image in the book is a collage with added found objects such as buttons, fabric, and seeds. Children can recreate Ehlert’s illustrations outside with real snow and household items. Pack some snowballs; roll them in more snow to make them big, then add clothes, kitchen gadgets, sewing materials, and whatever else is handy to make a whole family out of snow. Make an indoor snow family by using white paper circles and small items you have at home, glued or placed on the paper snowballs. “It’s Winter” by Linda Glaser, illustrated by Susan Swan. Even though this is written as a story, this book is full of facts about cold weather, snowflakes, and the change of seasons. Illustrations are beautiful cut-paper artwork and there are suggestions for activities in the back of the book. This book is the third book in a series of four titles on the various seasons, appropriate for early elementary ages. “Snow” by Roy McKie and P.D. Eastman. Two kids play in the snow and tell us about the fun they have skiing, making snow angels, building an igloo, making a snowman, and finally relaxing with mugs of hot cocoa. The rhyming text in this book is designed for beginning readers. “Animals in Winter” by Henrietta Bancroft. Illustrated by Helen K. Davie. Where do monarch butterflies go in winter? What does a woodchuck do when the grass is covered in snow? What do mice and deer find to eat when it is cold out? Each illustration in this short book has a few lines of simple text about the winter habits of a variety of animals. “Snow” by Uri Shulevitz. You know the kind of day when the snow falls lightly, but steadily? The fluffy snowflakes drop down lazily and no one thinks it is anything to worry about. In this story, a boy and his dog know that a few snowflakes can add up to a city being transformed into a winter wonderland, despite what all the grown-ups think. The simple, poetic text paired with watercolor and pen-and-ink illustrations mimic the mood of this slowly building snowfall. As the days get colder and darker, turn to family traditions to bring warmth and light into your home. Gathering with family and friends, spending time volunteering and helping others, or maybe cooking a holiday meal together can make winter special. Make sure to include books and word fun for your family, too. Adopt some of these ideas and create new family traditions that can be passed on to future generations. “A Book On Every Bed” for your family. Choose a book for each child–new or used. Wrap it and place it at the foot of each child’s bed one night before a holiday or other special day so the children wake up with a gift to open. Repeat next year (or next special occasion). Sing a holiday song together. 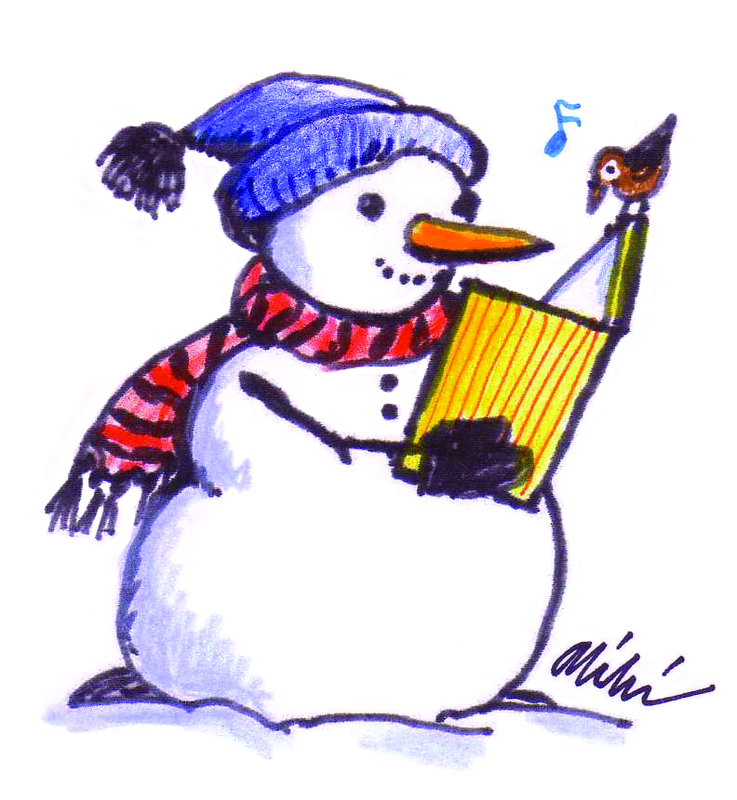 Teach your children the songs that celebrate the holiday you observe and sing them together. You can show them the written music, follow along on a You-Tube rendition, or just recall the song from memory. Talk about the words in the song. Those words describe events and thoughts from long ago. What do they mean to you now? Write cards. Help your child type out an email message or write on a real paper card, a note to a grandparent or far-away friend. When you send out a greeting, you may get one back! You can also show your child how to write names for place cards at a holiday meal, or names on gifts that you will be giving this holiday season. Learn from a book. Follow a recipe in a cookbook or follow directions for a craft project. When you find something you love to do together, do it again next year and start the tradition. Do you have a recipe for mulled cider or hot chocolate you can make together? How about cutting snowflakes out of paper and putting them in your window or making a bird feeder out of a pinecone with peanut butter and seed? Read books together. Start a collection of winter or holiday books that you bring out just at this time of the year. Add these special books into the mix of read-aloud to spice up reading time. 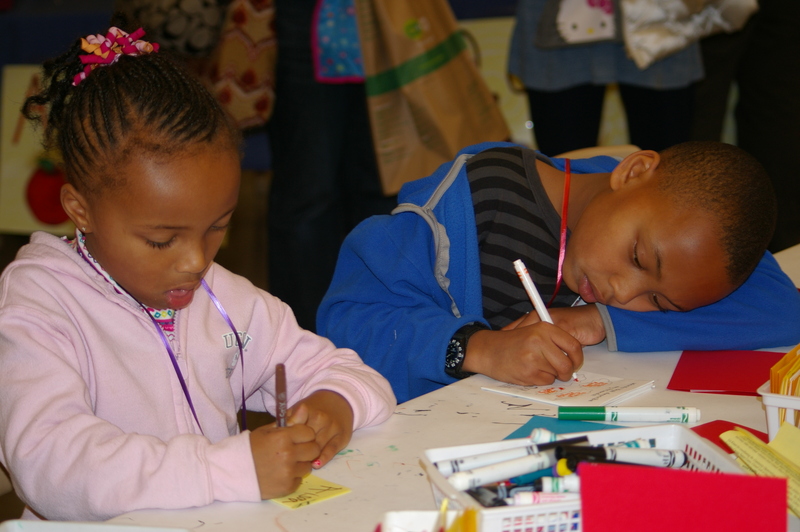 There’s no better way to stay warm this season than snuggling up with a child to read!